Modules enforce Strong Encapsulation as we discussed in the previous post. Now a Package is not public by default to all other modules unless it is explicitly exported in the module-info.java Module Descriptor. Can Class D from Module A access Class F from Module B? With the Module Descriptors mentioned below, yes it is possible as Module A has mentioned as it requires Module B and Module B has exports package Z.
Module must require other Modules to be used in them. Module exports packages to specific Modules or to all. Module opens packages explicitly for reflection. Accessibility is enforced by compiler, JVM and Reflection. Remember packages starting with sun. * or com. * that were available in rt.jar (JVM Runtime) which were only specific for certain JVM Vendor Implementations and not all. Java programmers have been constantly warned not to use these packages as they will break Platform Independence. But up until Java 9 Modules there was no way to completely stop developers from using those packages. 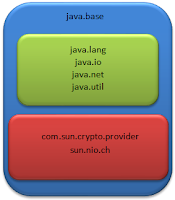 Following is the Module Descriptor for java.base module. With this as you can see only certain packages are exported and com.*/sun. * packages are only available within the module. Every Module in Java 9 implicitly will have require to java.base. Just like every class in Java will automatically import java.lang.*. 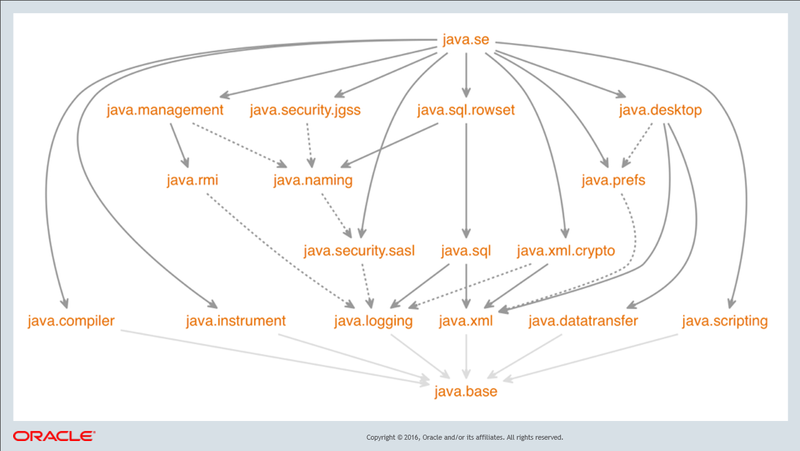 This means that now there can be a Java Application which is 100% modular with all Jar files being modules. Which means we can't use classpath in those scenarios. The runtime searches the module path when looking for a module. Plus a Java Application can be an hybrid of Modular as well as Backward Compatible Application in those cases there will be both a Module Path and Class Path. There is much so talk and hype about Java 9 and its features. There are so many posts about Java 9 and specially on Java 9 Jigshaw or Modules. As a Java Developer for almost a decade now, I was really cautious and concerned about the new features of Java 9 and wanted to learn about it in depth. What better way than learning from the creators of Java 9 itself. Recently I got the chance to view an InfoQ video on a Presentation done by Karen Kinnear who is the Technical Lead for the Hotspot Java Virtual Machine Runtime team at Oracle. This lead me to realize Java 9 is far beyond Modules and the in depth nature of the Modules and the necessity for such time and resource consuming change in the Java Language Framework and Java Virtual Machine. The Why of Modular JDK? The main reason for a Modular JDK was to avoid Classpath Hell. People who have experience Deploying Java Applications in Production or Pre Production Environments would agree that creating and maintaining the Classpath for a Java Application with the focus to enable future maintenance is a Nightmare and can become a Hell very soon if not done properly. OSGi Framework tried to address this by creating an Engine in which Classloader Isolated Bundles can run with Strict Contracts to Export and Import Dependency. This was a good approach to solve Classpath hell but the problem was an OSGi Bundle is a Jar on Steroids (Had to have a META-INF/MANIFEST.MF Bundle Descriptor). So Normal Jar Files had to be converted to a OSGi Bundle before those can be used inside an OSGi Engine. Making OSGi Bundles of already existing millions of Jars and maintaining them through latest versions in its entirety could be classified as Hell. So OSGi didn't catch up to its fullest potential. Plus JVM Classpath scanning was Sequential where when a Class is requested by an Application running in JVM it will scan the Classpath Jars one after the other until it finds the requested Class. This is an O(n) problem which needed to be addressed to improve performance. The Official Java Team had to come up with something off the shelf. This is the reason Why Modular JDK was created with all the difficulties. 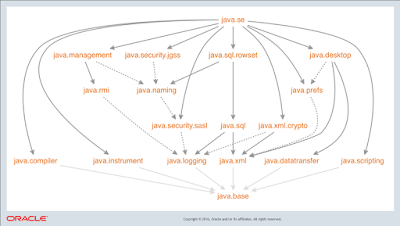 The How of the Modular JDK? How to create a Module in Java 9? A module is a same old Java Jar file with a Module Descriptor. A Module Descriptor is a Java Source file with the name module-info.java residing in the root of the source directory.